Should I Pack Extra Gear For a Day Hike? Looking specifically at a day hike, firstly, I do keep a spare set of clothes but I don’t carry them with me and they’re not hiking gear. Basically just a change of clothes I leave in my car that I can slip into after the hike is over. It is handy to have some dry clothes after you’ve been on a good hike. You have likely been sweating in your hiking gear and your hiking pants may well have got damp, especially in and around the top of your hiking boots, so a chance to get those items off as soon as possible at the end is desirable. What About While I’m Hiking? When it comes to taking extra hiking gear (gear that I wear) with me on my actual day hike, I do pack some extra kit with me, obviously, specifically hiking gear. To that end I will carry extra layers for warmth, protection and insulation. What extra do I carry? First on my list is a spare base layer (The one next to your skin). If you’re not familiar with a base layer, it usually covers your whole torso and sits quite close to your skin. It should have wicking capability allowing your skin to breathe but keeping it warm and dry as you sweat. All good modern base layers roll up nicely and so are very packable and light so it’s no big deal to take an extra one with you in your day pack on the trail. For me, depending on the time of year, this will be an extra tee or mid layer fleece. Again, as it’s purpose built hiking gear, it’s lightweight so it’s easily packed away and does not take up too much space in your day pack. Think wind protection in this layer too. Sometimes it might be too warm to wear a heavy outer layer and more comfortable with just your mid layer. In stronger winds though, you might have no option to put your outer layer on. If your mid layer has a bit of wind protection in it, this will help counter that and not have to put on an extra outer layer and be too warm on the trail. If the weather is such that my mid layers won’t be enough, I usually pack a very warm fleece to be worn just under my rain jacket. This main purpose of this layer is warmth and insulation. I’ll pack it away if I don’t need it and use it as required e.g. as I approach a summit where it’s very windy. This is a must. If you’re not wearing these from the get go, you should always have your waterproof kit, a rain jacket and rain pants, packed away in your day pack. On the odd day, if I know it’s going to be a blistering hot day, I might leave these in my car but that would be rare and as a general rule, always have these with you. I always have gloves (2 pairs in colder weather, 1 of them ski gloves), a cap or hat (beanie in winter, baseball in summer) and a neck gaiter (colder times only) packed away in my bag if I am not wearing them. Keeping your hands and face comfortable and warm is very important so I always have these bits handy to easily slip on or off. Should I Carry a Complete Change of Clothes? I have seen some recommendations before to carry a complete set of hiking gear replacement clothes, all your underlying and base layer clothes anyways. The idea here is that if you were to get completely soaked, say crossing a river, you have something to change into. My take on that is, as a general rule, is where possible don’t cross rivers. They can cause nothing but trouble so I think it worth it to avoid them if you can and so plan your route accordingly. Now that is more for day hikes. If you’re on a longer trek, then yes, a full spare set of clothes makes more sense to me. Not least as you will want to change after being in the same clothes for a few days. 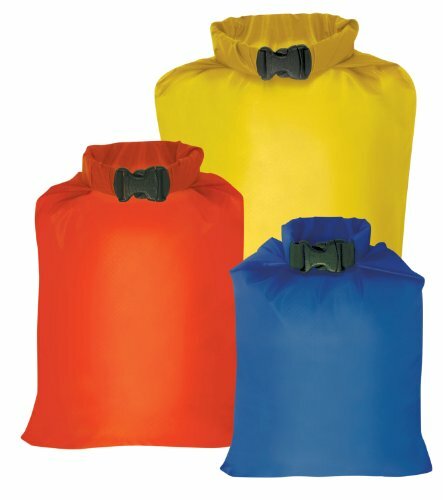 Even on a day hike, if you know you’re going to be traversing rivers, I can see how it makes more sense to carry more replacement gear carried in a dry bag, pictured below, should you be unlucky enough to fall into a river. Carrying any spare clothes in a dry bag is very important as if you’re getting very wet, be it by slipping into a river or getting caught in a deluge, it’s pretty much a given your pack and it’s contents are getting soaked too. The dry bag will keep your spare gear dry even when that happens. I started writing this post last Friday and as if to illustrate this last point, when I was out hiking two days ago, we had to cross a river. It was deep enough in places so we had to take care to find a good spot to cross. One lady slipped on a stepping stone and got badly covered in water, all her legs and one side of the top of her body. She was fine. It wasn’t warm but not mid winter so she was OK to keep going and dry off a bit as she hiked. However, if that was Mid December, that probably wouldn’t have been as reasonable a prospect. That’s where reaching into your day pack for a dry bag full of dry clothes would be very much appreciated! Also, if you’re hiking alone and get into difficulty and get soaked in a rain shower overnight waiting to get help, a set of dry clothes would be most welcome. I think this is where judgement, as always, comes into play. If you’re going out for a day hike in a large group in an area you know well and you won’t be crossing rivers in the middle of winter, I think it probably unlikely that you will get into such a position where you need a full set of clothes to change into. Should you be unlucky enough to get into difficulty, the people you’re with should be able to get help and your emergency blanket or bivi bag should keep you good till help arrives. However, if the same group is going out in bad weather into an area with lot’s of rivers that is also unfamiliar, for sure carrying some more extra dry gear, base layers, boxers, and so on, makes sense. In some ways I would like to be more precise in advice for this particular subject but ultimately, I think every situation is unique. You need to weigh up the challenge of the hike you plan to undertake to judge if carrying extra gear will be needed. In most cases though, I think you’re good with some minimal spare kit, mainly for weather protection (to stay dry, warm and insulated), and not a full set of replacement hiking clothes. Waterproofs are nearly always a must though. Finally, please note that I am only referring to clothing in this post. There are of course other key hiking accessories that I carry with me on a day hike but I will leave that for another post. Check out the complete day hiking checklist for a full inventory of kit I generally take with me on a day hike. If you’re unsure, always ask for advice from more experienced folks or feel free to ask me in the comments below. What Should I Pack for a 2 to 3 Day Backpacking Trip? Can’t I just Use Any Old Day Pack For A Day Hike? The Top 10 Essential Gear Items You Need For Winter Hiking! Carry Extra Layers Of Hiking Clothes When You’re Hiking Always Wear the Right Hiking Gear on Your Hikes!